Character: Brewed with Belgian Witbier yeast, hibiscus flowers, ginger, coriander, and orange peel. So far every beer I have had from Buffalo Bayou has been above par, for sure. These guys definitely brew up some very tasty brews! 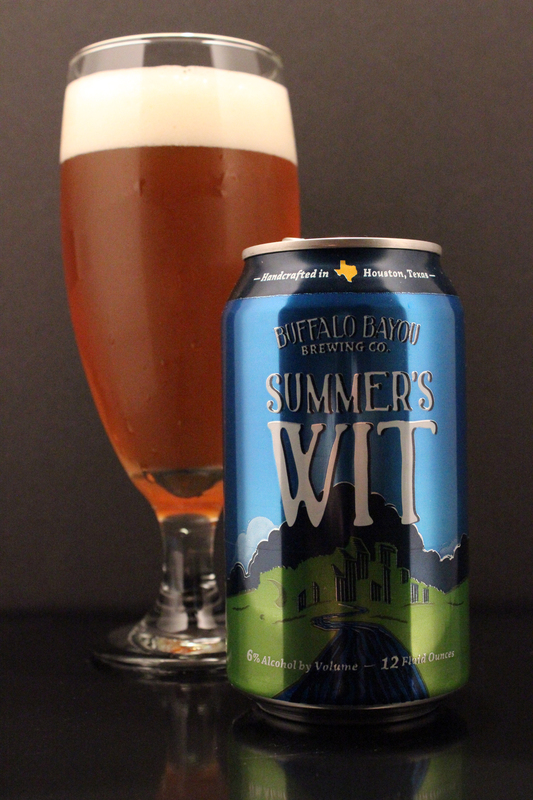 Summer’s Wit is part of their Secessionist Series, which is their ambitious and boundary-pushing brewing series. As simple as the name of this beer is, and the pretty normal looking can, the beer within is actually a pretty complex piece of work! Poured into an Imperial Pokal or Pilsener style glass from a 12oz can. Summer’s Wit poured a light hazy golden color topped with a good inch of white frothy head. which did not stick around much longer after snapping a few photos. In fact, it completely disappeared, leaving no lacing at all. The nose is strong with Belgian yeast character, real banana flavor. Nice notes of citrus, pepper, coriander, ginger, and a nice added floral aroma. I really enjoy the smell of strong Belgian yeast, and the added citrus, coriander, and ginger really add a nice balance, giving this beer a pleasant aroma. The taste mirrors the aroma pretty closely. Once the beer hits the palate, it was completely dominated by the banana notes of the Belgian yeast with an added touch of slight black pepper. The added orange peel, coriander and ginger really add a nice touch to this beer. Ginger is usually an added ingredient that I particularly am not 100% fond of in beer, but I actually don’t mind it here. It is a subtle flavor hidden behind the other flavors. Citrus and spices are profiled nicely against the Belgian yeast and wheat. There is a lingering aftertaste of orange peel and ginger mostly, but a nice dry spiciness make an appearance. The body is light to medium in thickness. The mouthfeel is nice and smooth, and a bit creamy. There is a nice dry finish. Overall, I can see how this beer is part of Buffalo Bayou’s experimental series. I know there will be some purists out there who say this beer isn’t true to the style, blah, blah, blah, but damn, this is a mighty fine brew. I really like what they did with the added ingredients. Everything in this beer works together and gives it a complexity, but well balanced. I recommend if you can get your hands on this beer, do so! Metal Connection: “Summer Breeze,” a classic song that I really like by Seals and Crofts, but it got a Metal twist to it when Type O Negative covered the song on their 1993 full length album, Bloody Kisses. Type O Negative had a great successful career following this album with the singes “Christian Woman” and “Black No. 1.” The song “Summer Breeze” was also very well known after it made an appearance on the 1997 horror film, I Know what you did Last Summer.You know, the song during the opening credits sequence, yeah, that one!